The 'Wonderful Life' hitmaker - who performed under the alias Black - passed away in hospital at the age of 53 yesterday (26.01.16), two weeks after he was involved in a car accident. The Liverpudlian singer had suffered head injuries in the crash in Ireland on January 10 and was placed in an induced coma in the intensive care unit of Cork University Hospital, but never regained consciousness. He died peacefully surrounded by his family - wife Camilla and their three sons - who were "singing him on his way". The family has paid tribute to the care Colin received. They said in a statement: "Colin received the best possible care from the expert and highly professional staff there and we are deeply grateful for everything they did". Pete Wylie of The Mighty Wah! has paid tribute to his friend and fellow singer on Twitter. 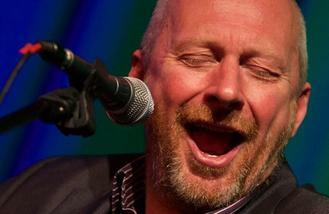 He tweeted: "Such terribly terribly sad news about Colin Vearncombe RIP. "I want to send all the love I can muster to Colin's parents, brother & partner + to all who loved him, and who he loved too. The family will hold a private funeral service, but a public memorial will also take place in Liverpool in the coming weeks. Further details, including a charity in which donations can be made in memory of the singer, will be released in due course.